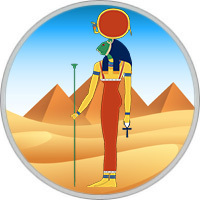 Sekhmet Dates: July 29 – August 11, October 30 – November 7. Traits of Sekhmet people: Clever, Leader, Authority. Lucky Colors: Green for men, Turquoise for women. Associated Zodiac Sign: Sagittarius ♐. Sekhmet - the goddess of war and quarrel, she sends to people all kinds of misfortunes and epidemics, however, in her power to rid people of illnesses. She is the patroness of doctors and magicians. Her name is translated as "strength, power", and the main goal of its existence is justice. Her court is impartial, it is not natural for her to have pardon and forgiveness. Traditionally, she was portrayed as a woman in a long tunic with a lioness’s head. Sekhmet Children enjoy great prestige, and always deserved. They are demanding and accurate, they love to seek truth. They are suitable for the profession of lawyers and judges, as well as any managerial positions. Despite their harsh temper, luck always accompanies them, and all their endeavors come to the end safely. These people are very proud and often adamant. They are charismatic and passionate. Despite this, they are perfectly in control and rarely make mistakes. They have many friends, although they are rarely condescending to friends. Born in this period, even externally something is subtly similar to a lion. Their strength and pride are reflected in the gaze, and the strong-willed face betrays the imperious man. However, they also have a weak spot — they crave fame and recognition, they care about people’s opinion. They find it difficult to find a suitable partner in love — they are too demanding to treat any imperfections and small weaknesses. You can advise them to learn how to accept people as they are, be more flexible and learn how to forgive. Men of this Egyptian Zodiac sign are real favorites of fate. Luck accompanies them always and everywhere. The Sekhmet man can appear at the most unexpected moment in the place where he can not do without his help. He will gladly take up any, even the most difficult thing and be sure to succeed in it. Passionate, resolutely go ahead to achieve this goal. They will never step over their pride. Despite their behavior, they are always surrounded by people who are ready to help at any time. Women born under this sign try to control themselves in any situation. The Sekhmet woman is arrogant, impressionable and straightforward. She behaves very carefully and tries to stand out from the crowd. The main goal is to become popular and succeed. A true perfectionist will never be 100% satisfied with the result, so she continues to confidently go to the goal. It is necessary to learn flexibility and try to find a way to control your emotions, which are not always deterred.